Back when I was younger than I am now and a diligent student, history was one of my better classes, especially when the subject in question where the Greeks, the Romans and the Vikings, so when you get a game that has some The Legend of Zelda styled gameplay and draws heavily on Norse Mythology, you can pretty much bet I will get excited about it. So excited in fact that I actually did check out the game on Steam, but put off completing it, because I’ve been holding out for the Wii U console release (which we now know will be the 8th of September.) 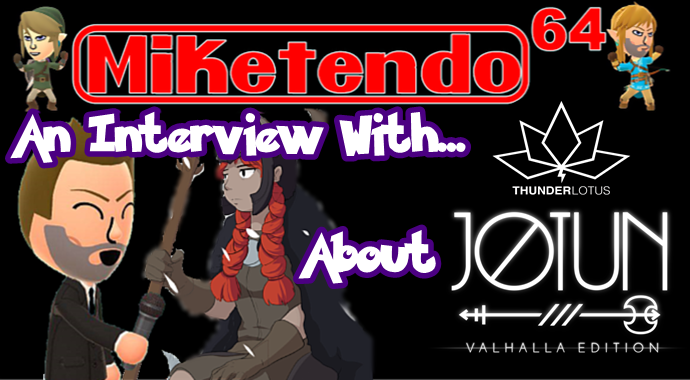 But having checked it out for myself, and following the game closely, this month I decided I wanted to talk to the man behind the game. Miketendo64: “No, not lame at all, but since we’re on the subject of hand-drawn, how many hand drawn sketches make up all the cut-scenes of the game?